This poster for the week commencing the 22nd October 1951 is typical of the style of variety posters of the 1950s, with its red and black lettering, and the names of the performers separated in boxes. The size of the box for performers’ names depended on the magnitude of their fame. This advertises a twice-nightly show from the Shepherd's Bush Empire which was to be broadcast live on the radio on the Tuesday night. Lee Lawrence, billed as 'Britain's outstanding singing star', gets the biggest box, with a 26-year old comic: 'Radio's Peter Sellers', a close second. By October 1951 Peter Sellers had made his name in several BBC radio shows including Show Time, It's Fine to be Young, and Ray's a Laugh. In May 1951 he first appeared in another radio show called Crazy People with Michael Bentine, Spike Milligan and Harry Secombe. By the second series in 1952 the title was changed to The Goon Show. The performers who get one of the two smallest boxes on the bottom of the bill are Morecambe & Wise, later to become the hugely successful comedy double act made famous throughought the country by their own television show broadcast from 1961 until 1968. Typographic poster printed in red and blue on cream paper, with the name of the theatre - Shepherd's Bush Empire - in blue ink against a red textured background at the top of the poster, in a red outlined rectangle, the word 'Empire' printed in large 3-D effect print. The rest of the poster consists of the names of the performers, in blue and red print, all within variously sized red lined rectangles, the entire text being bordered in red. The name of the printer, bottom left, is in red lettering. 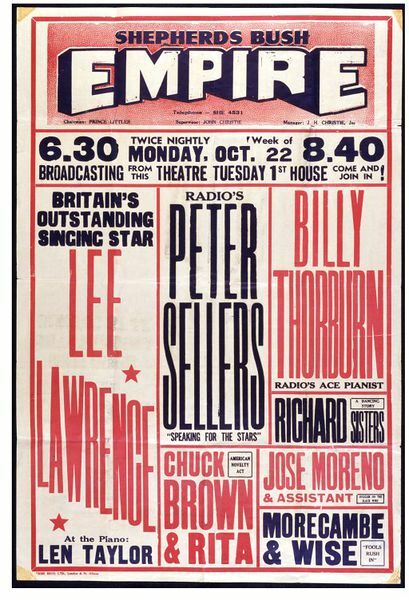 Poster advertising a twice-nightly Variety programme at the Shepherds Bush Empire, London, for the week commencing Monday 22 October 1951, to be broadcast on BBC radio at the first house on Tuesday 23rd October. 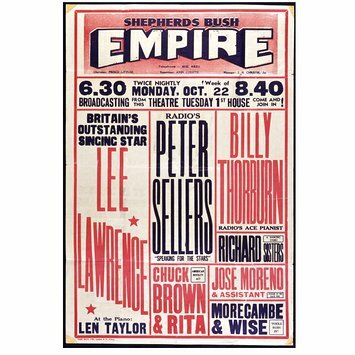 The programme starred Lee Lawrence, billed as 'Britain's outstanding singing star', with Len Taylor at the piano, and the number two act 'Radio's Peter Sellers,('Speaking for the Stars'). Other acts on the bill were Billy Thornburn ('Radio's Ace Pianist'); The Richard Sisters, ('A Dancing Story'); Chuck Brown and Rita ('American Novelty Act'); Jose Moreno& Assistant ('Juggler on the Slack Wire'), and at the bottom of the bill, Morecambe & Wise ('Fools Rush In'). 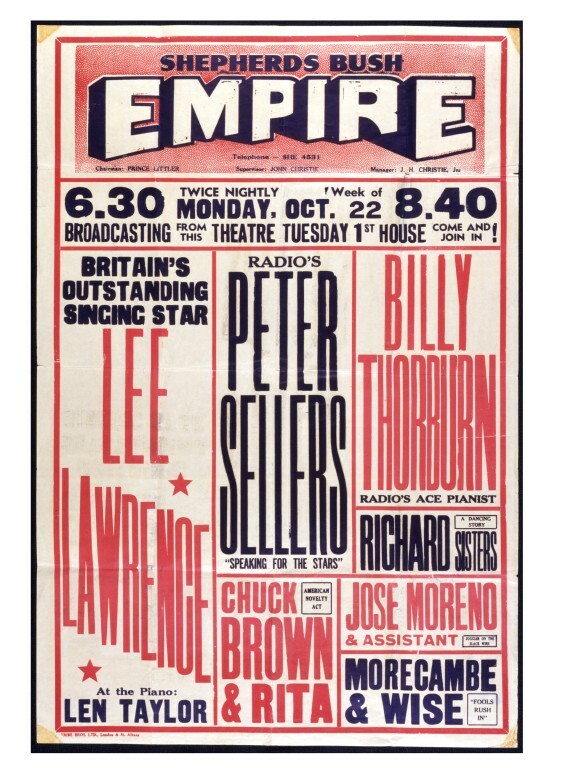 Typographical poster printed in red and blue ink, advertising a twice-nightly programme of Variety at the Shepherd's Bush Empire, for the week commencing 22 October 1951, starring Lee Lawrence, billed as 'Britain's outstanding singing star', and also featuring Peter Sellers and Morecambe and Wise.